Google Docs tried to get rid of checkboxes in the new UI, but users complained and the feature is now back by popular demand. "This is actually a hybrid of checkboxes and the more recent selection model. So you can use checkboxes, but you can also still use Ctrl or Cmd to select multiple items. Another one I like a lot, is to use Shift to select many consecutive items at once (click on the checkbox of the first file, scroll down and hold down Shift when you click on a checkbox further down the list, this will select everything in between)." Checkboxes may seem unnecessary, especially considering that people rarely select multiple files, but they're a familiar interface element that's easy to use. Not many people know that holding down Ctrl lets you select multiple files, even though it's a standard feature in most operating systems. Yeah, it took me a little fiddlin to realize that there was a new way to select documents, but once I figured it out, I liked the new way quite a bit. For that reason, I'm sorry to see the return of check-boxes - they unnecessarily clutter the interface. Maybe some day we'll get lucky enough to see the good ole > mark, a la Gmail, signifying keyboard shortcuts have arrived for Docs' home page . . .
Maybe the re-established check box is an introduction? Here's keeping my fingers crossed. I also think they are a backward step. I have read the article right and both ways are staying. Hopefully once people adapt to the new way Google can attempt to get rid of the ugly and now unneeded check boxes or at least provide a user with a option to remove them. Perhaps it is a step back but i feel the highlight color isnt dark/strong enough (compared to mac ox for instance) and this applies to the spreadsheets as well so a checkbox for me removes all doubt that something is selected. And since you can select multiple files why cant you open them all at once? Or am i missing something? 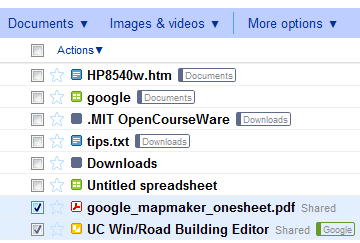 Although the docs list seems to refresh (not sure if its push or every few minuts) I would like the refresh button back. Thanks God. I've been waiting for this feature back!!! For those who were using new way of selecting I will say that it works too! So you can select files via both checkboxes or 'mouse method'. And just as small a change but with a bigger impact to me is that Google Docs Drawings finally added in an Underline button (to go along with Bold and Italic) for text. I create many wireframes in that tool, so it's a big win to not have to draw lines by hand under link text in my IA drawings! Any other small changes that showed up there unannounced that anyone notice?